Fall calls for comfort food. 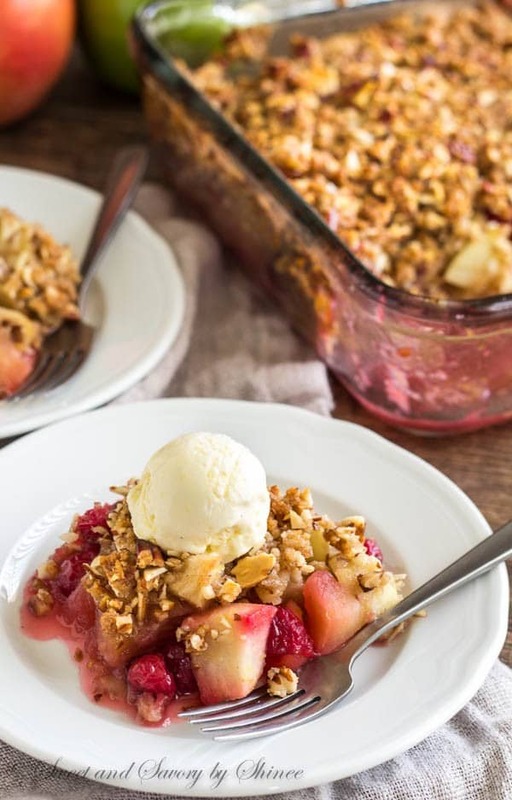 And what’s better than warm apple cranberry crisp with nutty, crunchy crumbs and sweet n’ tart apple cranberry filling? 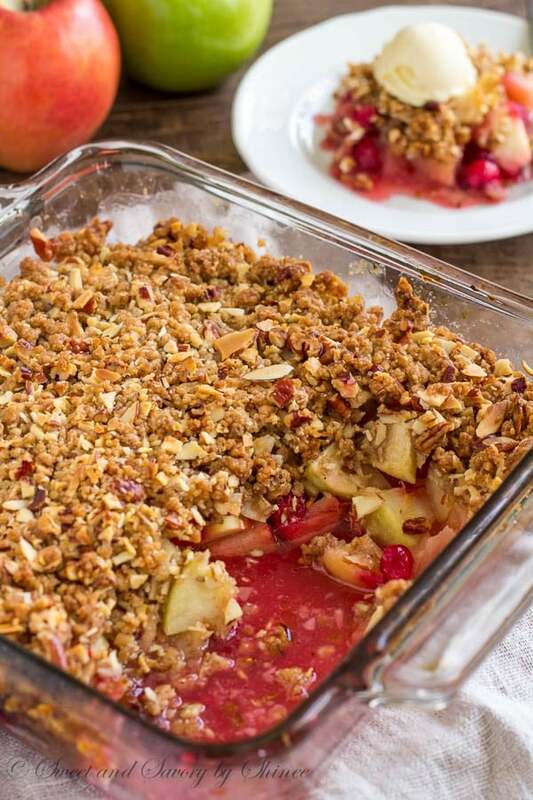 Oh my gosh, I wish you were here in my kitchen to share this warm apple cranberry crisp with me right now. Filled with all sorts of fall flavors and topped with nutty-buttery-crunchy topping, this wonderful classic fall dessert fills your kitchen with sweet comforting aroma that lingers for hours. I could bake this every day just for that smell! 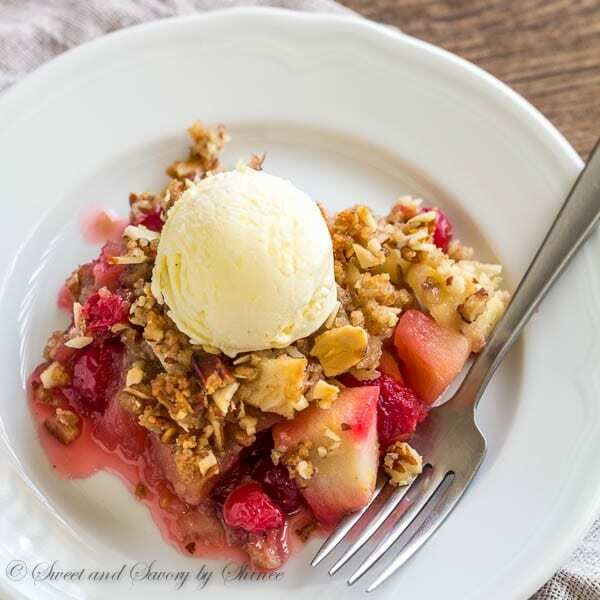 The balanced combination of sweet and tart flavors from apples and cranberries takes the classic apple crisp to whole another level. I just love the slight tartness from cranberries, you know. And the mixture of nuts gets toasted during baking and adds nice texture to the crisp. It really takes no time to make this. Less than half hour of hands-on time, and the oven will do the rest for you. Easy-peasy! Now, let’s talk about what kind of apples to choose for this crisp. For sweeter crisp with a hint of tartness, I suggest to go with sweeter apples, such as honeycrisp, golden and/or red delicious. The combination of honeycrisp and golden delicious was the winner in my family! And here is a quick step-by-step tutorial for ya. Did I mention how it fills your house with amazing fall aroma?? So, so good! By the way, I updated the “From Your Kitchen” section over the weekend with new photos of all the goodies you’ve created from my blog. Thank you so much for sharing and tagging! It really means the world to me. If you ever make any of my recipes, don’t forget to snap a pic and e-mail it to me, or share on Instagram with a hashtag #sweetandsavorybyshinee. In a food processor, combine flour, sugars, cinnamon, nutmeg and salt. Pulse until combined. Add butter and pulse for about a minute or so, or until the mixture is crumbly. Add nuts and pulse a few more times. The mixture should look like wet sand with small chunks of nut. Refrigerate the mixture while preparing the filling. Peel and quarter the apples. Cut out the core and slice into flat chunks. 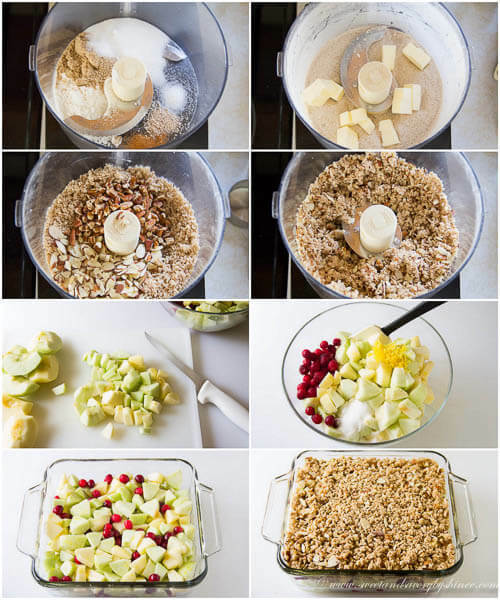 In a medium bowl, mix together apples, cranberries, sugar, lemon juice and zest. Pour the fruit mixture into 8-in (20cm) square dish, or 9-in (23cm) round deep pie pan. Evenly spread the topping over the fruit mixture. Bake for 40-45 minutes, or until the topping is the golden brown and the filling is bubbling. Serve warm with whipped cream or vanilla ice cream. 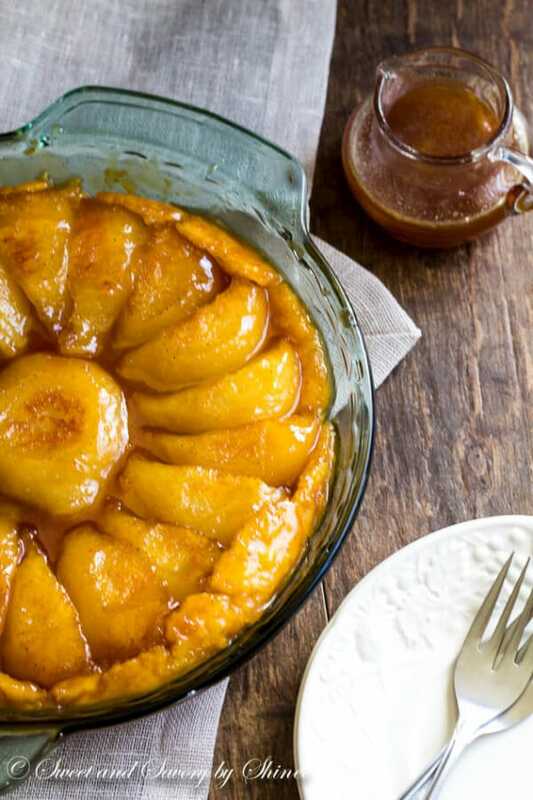 Try my fabulous Pear Tarte Tatin. Or this pumpkin mousse pie.